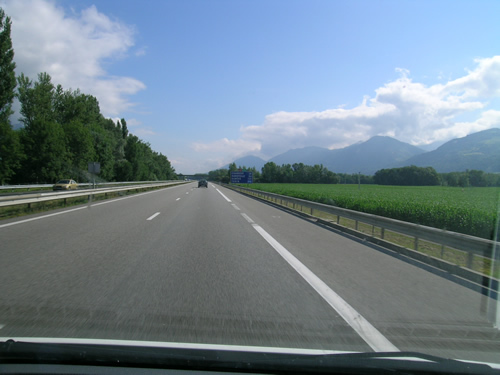 After the breakfast stop, we continued up the A7 highway and crossed the Rhone River. Then we saw the Giant of Provence, Mount Ventoux. We all took note of how she stood out against the relatively flat countryside and couldn’t wait until the end of the trip when we’d take our shot at climbing the legendary mountain. Finally, I got the GPS back on line and was able to return to navigating. 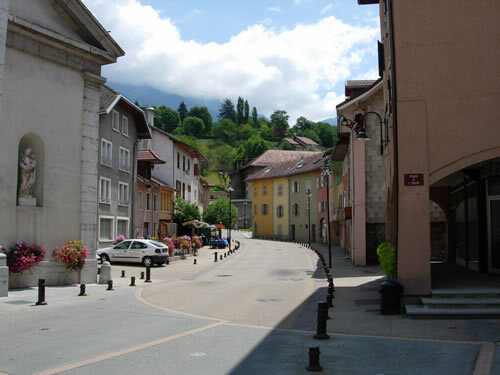 This turned out to be critical as we entered Grenoble and found ourselves on city streets looking for the next road. It seems that the city was completely under construction. 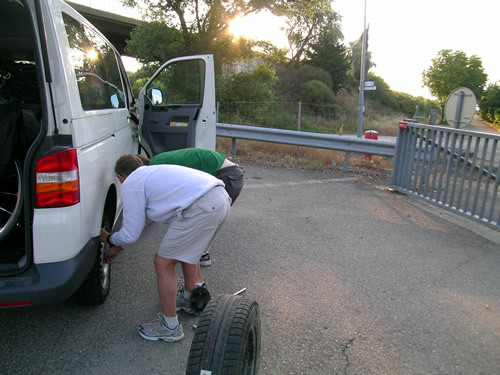 As a result, we missed a couple of turns and the GPS proved itself its weight in gold finding alternate routes. 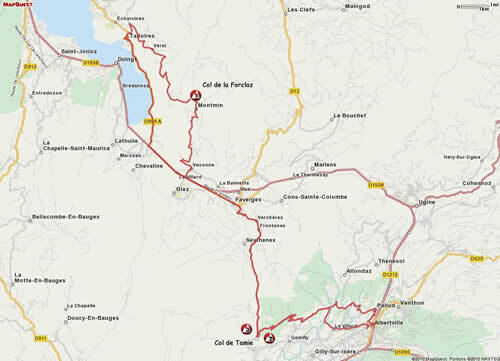 Tom was doing a great job driving, including backing up for about 100 m in Grenoble to find one of these alternate routes. 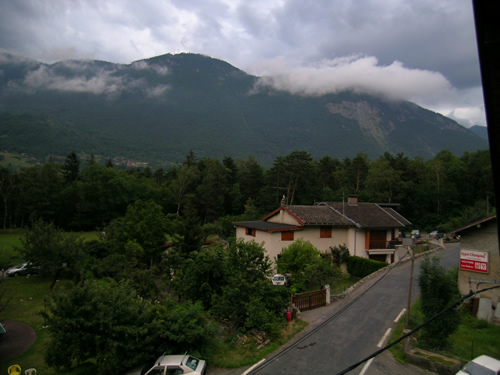 Finally, we were on the road to Albertville, finally getting head long into the Alps! 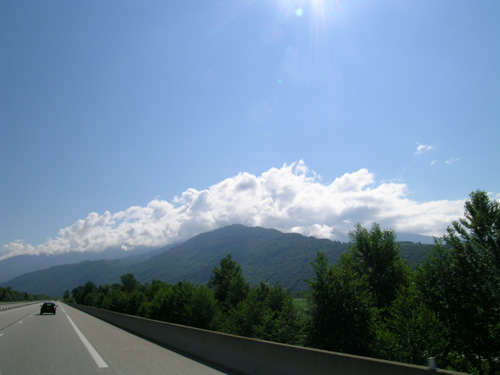 Below are some pictures from the highways drive showing how beautiful the scenery is in this area of the world. 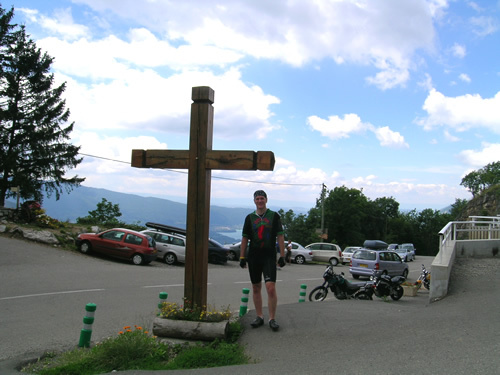 I liked climbing this mountain as it wasn't very steep and the small roads are exactly what you think of when riding in France. Below are me (left) and Paul (right) taking a rest break to take pictures. Tom had already taken off for the summit. 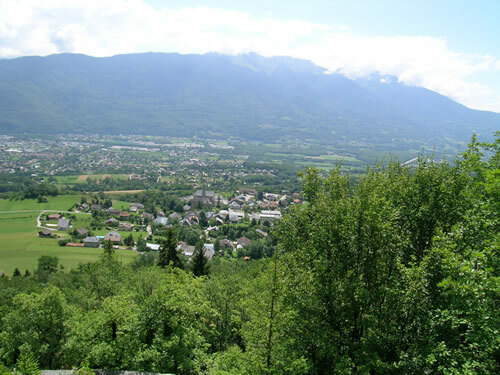 Here is a nice view of Albertville France from the lower slopes of the Col de Tamie. Albertville is a nice little town, nothing like I remembered from watching the Olympics on TV, although it did provide a pretty vivid picture of what I thought an Alpine village would look like. We parked in a public lot and had plenty of privacy .. at least for now! Seeing it was lunchtime, we needed to fuel up before setting out on our ride. In order to get into the spirit, we all bought sandwiches for lunch at one of the small bars that was open in town. I had a cheese sandwich, Tom and Paul had likewise. 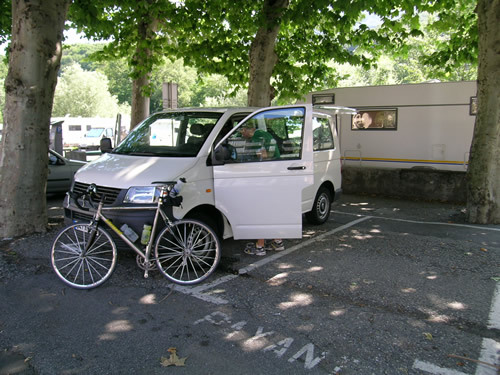 After lunch it was back to the infamous van to get changed for our first ride over the Col de Tamie and the Col de la Forclaz. 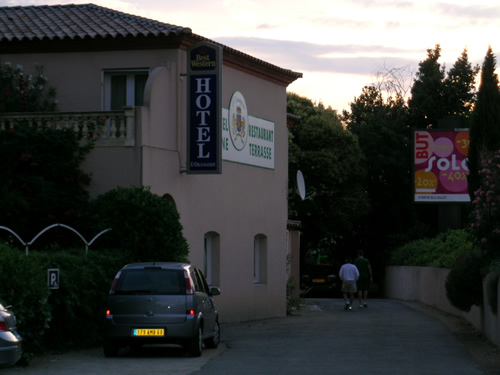 We got up this morning around 0600, got ready and left the Best Western Hotel in Nimes for the drive to Albertville. We were excited to get our first ride underway, but had to drive a bit to get there. My GPS was acting up, so I had to do a bit of hand navigating. Since this trip I learned that sometimes you have to delete the initial point on a planned trip as the unit trys to send you backwards and always wants to create a new route until you go to the beginning. The top of the Forclaz was pretty crowded all things considered. 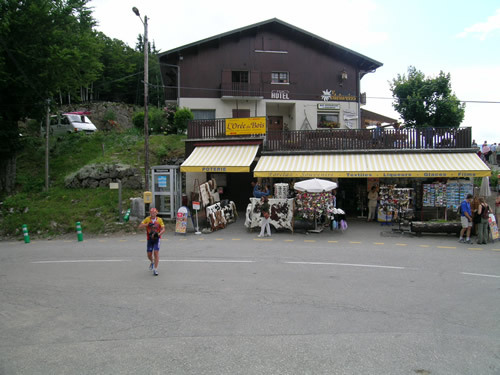 As with most French Mountains, there was a shop where you could buy snacks and souveniers. Many have actual bars where you can buy a coffee, sandwich or even a beer. Above you can see pictures of Tom and me standing by the large cross that was at the summit. Paul opted to head to the store to buy water. 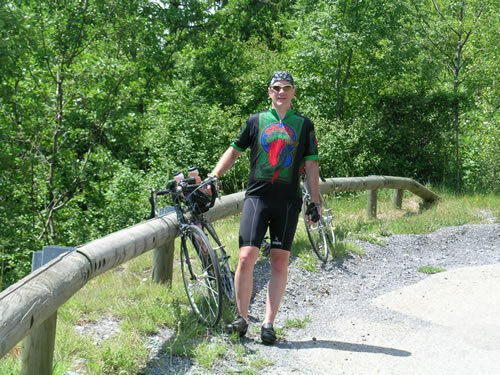 We hadn’t been riding too hard to this point and after our long plane trip yesterday and the long drive this morning, Tom (a.k.a. the animal) was dying to air out his legs, so he took off up the climb and Paul and I decided to ride at leisure and just survive to fight another day! In hindsight, that was probably a good idea. 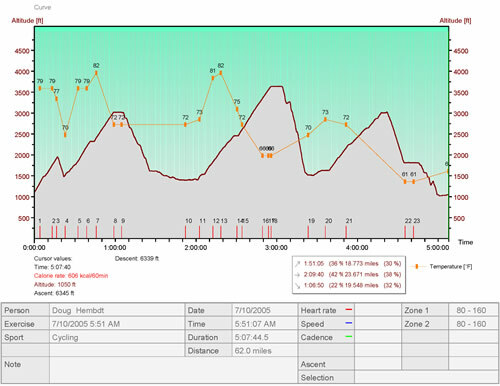 After a nature break on the climb, we continued upward and the climb became noticeably more difficult. Paul ended up passing me by while I personally struggled and began to wonder what in the world did I do by agreeing to do this for two weeks! 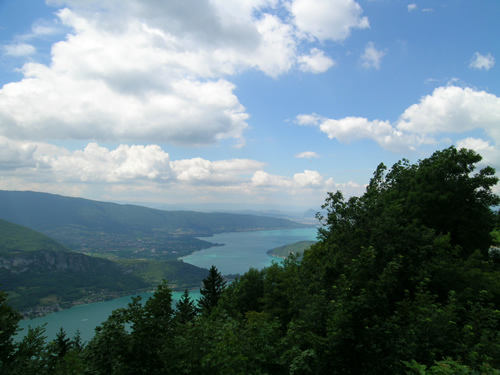 Anyway, as all dedicated climbers do, I struggled on in my 39 X 27 and eventually made it to the top where we had an excellent view of the lake and the hang gliders. 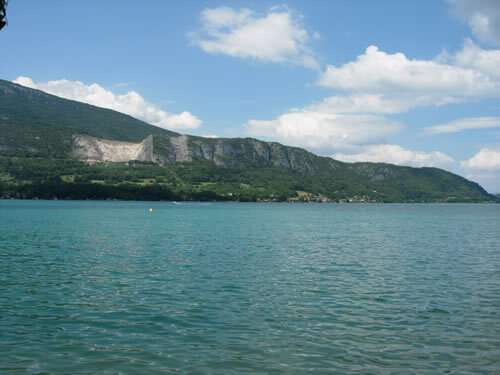 The Lac de Annecy was nothing short of beautiful. 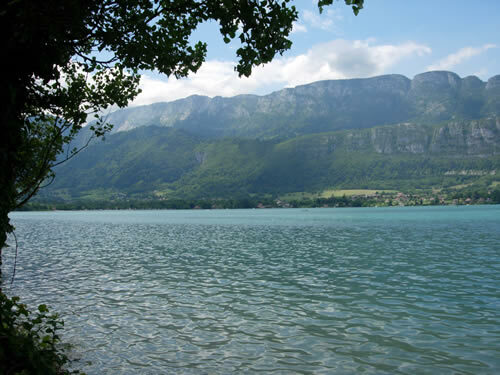 The lake was deep blue green with all the mountains surrounding it. Obviously this is a very popular area for summer recreation. It also seems to be popular with the women for sunbathing which definitely made our ride more enjoyable. One couple even seemed to be truly enjoying the peace and quiet on their dock, although I’m not sure what was happening under that blanket! 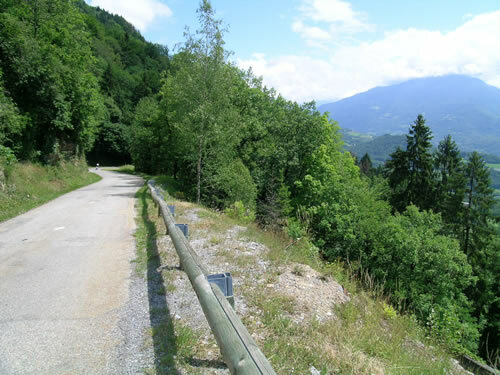 We continued on this route until we reached Talloires, where we headed up the Col de la Forclaz. The descent from the Col de Tamie into Faverges was pretty nice and while the climb wasn’t terribly difficult, it was nice to cruise downhill for a while. The town was extremely quiet but quite beautiful. 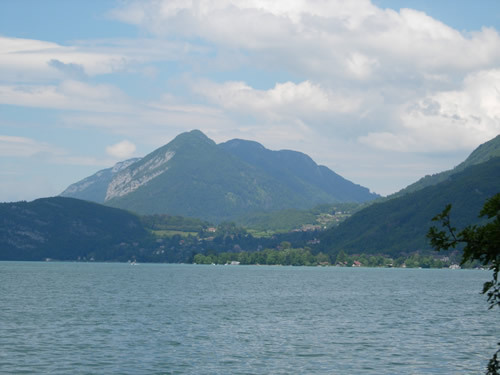 After leaving Faverges, we had to ride along a busy road for a short while as we headed towards the Lac de Annecy and the Col de la Forclaz. As we left Albertville, the early stages of the Col de Tamie, were pretty steep. It amazed me that the peleton can climb up these tiny roads. We passed several riders on the way up and saw even more descending after their climb. It was a great day, sunny, a few clouds and a 77 degree temperature. All in all, it was a beautiful day. The descent from the Col de la Forclaz was a blast and I rocketed down the mountain all the way back to the main road where I waited for Tom and Paul. 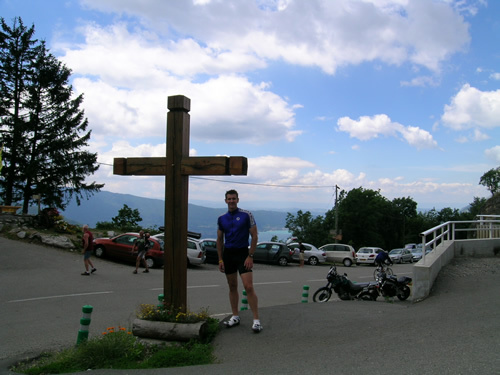 It was neat descending this side as that the Tour had climbed it in 2004 and you could still read all the writing as you passed…….. EPO Lance….. Virenque! While the climb back up the Col de Tamie wasn’t that steep, it was long and after the long day of driving and climbing, I was personally starting to get very tired. The skies also were not looking so nice either and as we approached the top, it started to rain very hard. The hard rain made the descent tricky and we had to stop once and take shelter under the overhang of a barn until the rain let up a bit. Luckily we had no crashes. Upon returning to the van, we found a bus tour group had invaded our nice quiet parking spot and they were everywhere. Being tired and wet, we ignored them and changed into dry clothes as the rain had subsided considerable. As the sun started to set, the fog began to roll into the valley. 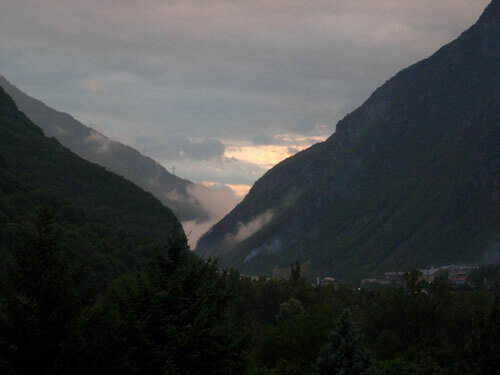 This was the view from our hotel looking up the valley towards tomorrow's climb of the Madeleine. Also, Albertville was in that direction. 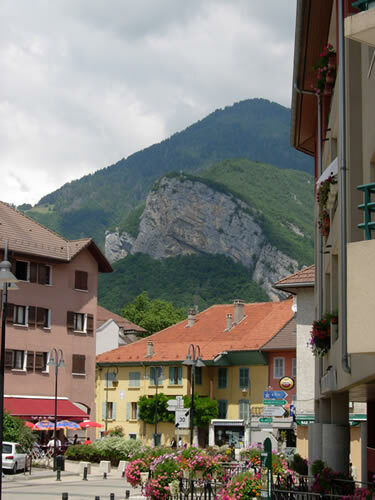 After checking in, Paul found out where Vigo and the boys from Maryland were staying so we took the short drive to Moutiers to see them. 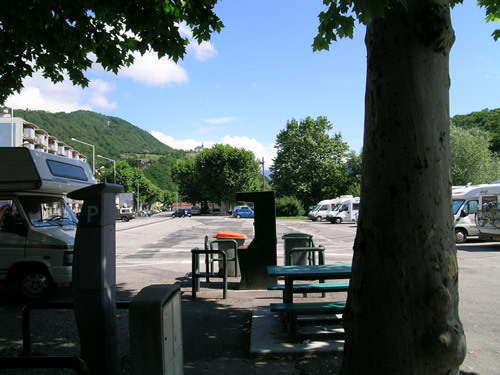 All in all, they had a much better place to stay and we’d be spending much of our free time in Moutiers when we were not riding. 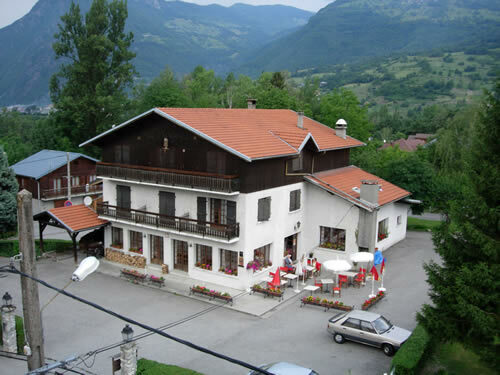 After dinner, we headed out of Albertville and towards Aiegueblanche where we were spending the night. 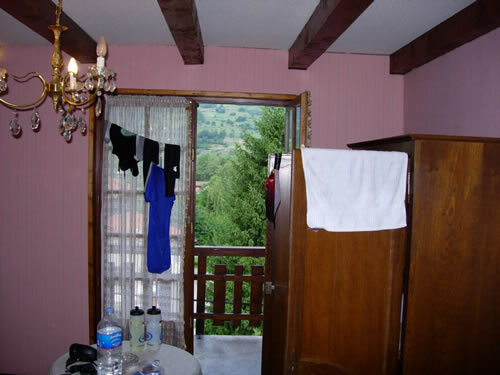 Our hotel was in a beautiful spot, but we seemed to be put into the equivalent of the loft in a barn! The room had no TV, and only a single working light bulb in the main room. All just part of the experience .. we lived and now it is fun to look back on it.